Whether you are interested in creating a perfect outdoor sound system for your patio or deck, speakers whose cords will not tangle whenever you move them, or a theater-like surround-sound system in your family room or man-cave, Bluetooth and wireless speakers can be a great addition to your home audio system. The audio experts at Kazoo Audio can help you choose the best Bluetooth and wireless speakers for your audio needs. We have a huge passion for music and believe in helping our customers realize the benefits of putting music in their life through the high end products we feature. 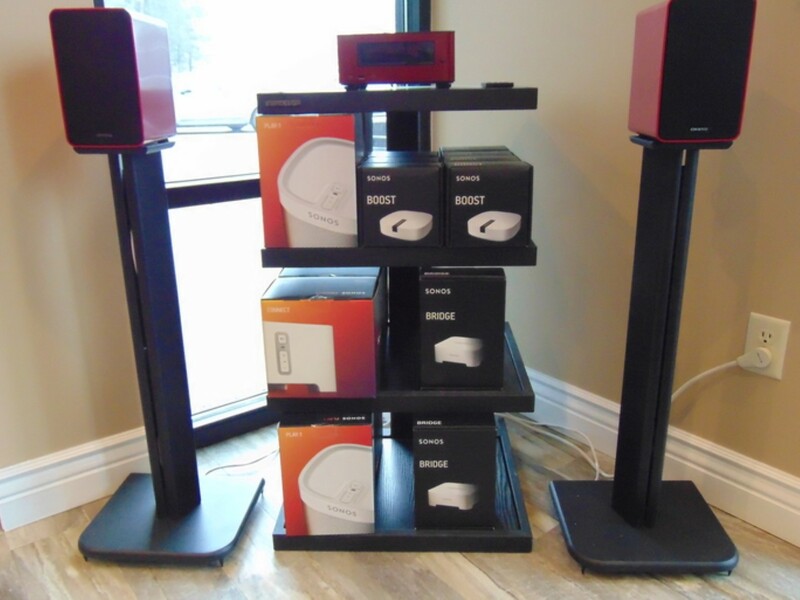 The audio experts at Kazoo Audio can help you choose the best Bluetooth and wireless speakers for your audio needs.We have a huge passion for music and believe in helping our customers realize the benefits of putting music in their life through the high end products we feature. Because there are no wires tethering these speakers to your device, you are afforded complete freedom to move them wherever you would like. Wireless speakers are either powered by rechargeable batteries or an AC adapter that must be plugged in. This means that without fully-charged batteries, your wireless speakers will still have at least one wire, and it will be tethered to an electrical outlet. Generally, larger speakers need to be plugged in at all times to maintain consistent power throughout use. While inconvenient, these larger speakers have the ability to provide a much louder, nuanced sound (complete with noticeable bass and treble adjustments) than the smaller, more portable types that are more appropriate for travel. Conversely, RF cordless speakers are designed more as a permanent option for listening to music at home. Typical cordless speakers differ from hardwired loudspeakers because they use radio frequency (RF) waves to receive audio signals from devices, rather than cables that connect the components. Products can typically transmit over a range of 150 to 300 feet, and can even traverse floors, ceilings, and walls. .
Like cordless phones and baby monitors, most wireless speakers generally use a signal frequency range of 900 MHz. These speakers may feature multiple transmission channels that can be changed via an attached knob so RF interference from other devices can be avoided. Typical cordless speakers differ from hardwired loudspeakers because they use radio frequency (RF) waves to receive audio signals from devices, rather than cables that connect the components. Products can typically transmit over a range of 150 to 300 feet, and can even traverse floors, ceilings, and walls. Bluetooth speakers are typically less expensive than the larger, cumbersome cordless speakers intended for home use. They typically run on rechargeable batteries and are an excellent option for playing music outside, at the beach, or really anywhere that you want to listen to music on the go. Since Bluetooth works by pairing to a device such as a smartphone, a transmitter is not required, but you can only stream music to one speaker at a time, rather than playing audio in stereo. Also, because Bluetooth-enabled devices use a special radio communications system, they do not need to be in the visual line of sight of the speakers.